Using your suitcase as storage instead of an actual suitcase? Starting to actually look like your passport photo? It's time for a break. Visit Pottsville and take your pick of 3 hotels within a 5-kilometre radius of of the centre with the help of your pals at lastminute.com.au. The Big4 North Star Holiday Resort and Hastings Cove Waterfront Holiday Apartments are just a few of several digs that are near the downtown action. Even though it's 19 kilometres outside of the central area, Murwillumbah is certainly worth checking out. It's got 4 places to select from, such as the Poinciana Motel and Econo Lodge Murwillumbah. Looking for more options? The Shirley Beach Houses is situated 30 kilometres away from the main central district, and the Amala Villa is 30 kilometres away. Others include the Drift, 30 kilometres away, and the Beach Suites, 30 kilometres away. But don't just limit your sightseeing to Pottsville. Take some time to check out some of the amazing attractions and activities that the wider New South Wales region has to offer. Sharpen your landscape photography game by checking out some of New South Wales' stunning rural landscapes, beaches and coastal plains. History museums and craft workshops are a few more tourist hotspots worth whipping out your camera for. Visitors with a serious appetite for adventure might also like to try a little snowboarding in this corner of Australia. After more options? Hole up like a rockstar in Casuarina (just try not to wreck the joint). Located 11 kilometres away and home to the Kingscliff War Memorial and In2Surf Surf School, it's bound to be a trip to remember! 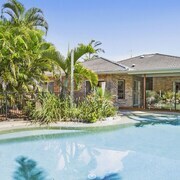 Some of our recommended Casuarina accommodation options are the Santai Retreat at Casuarina Beach and Cotton Beach Resort - Tweed Coast Holidays. Or, you could stay in Yelgun, 11 kilometres to the southwest of Pottsville, where you can pick from the Ocean Shores Motel and Crabbes Creek Cottages. The Brunswick Picture House and the North Byron Parklands are popular attractions to experience in Yelgun. Totally over plane food? Dying for a bit of privacy? Then you'd be crazy not to see if you can grab a room at the Kirra Beach Apartments or the Oceanside Resort. 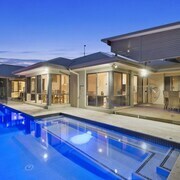 Both are a stone's throw from Coolangatta Airport, 25 kilometres from Pottsville's centre.